One of the supermodels of my teen years was Colleen Corby. She did like 15 Seventeen magazine covers. She was in both the Sears and JC Penney catalog. She was in an ad on every other page of every magazine. I thought she was gorgeous. it took some doing, but I found a pic of her today. She looks like someone I’d like to know. I bet she has some stories. I adored Colleen. She was a big part of my teenage years, cuz it was all about the clothes, and nobody wore them better than Colleen Corby. She’s still beautiful! I remember her well. She was truly beautiful, but amazing what the years gone by do to everyone. Colleen is an American Beauty, As a teenager, I was always captivated by her style and class. 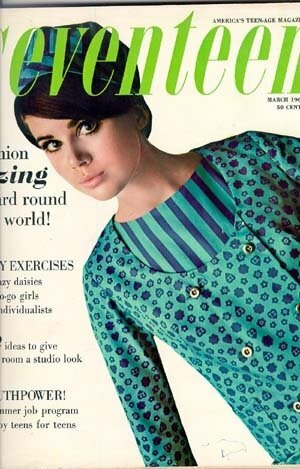 Colleen Corby was such a fabulous representative of us teen girls in the 1960's. She looked adorable in everything she modeled and, as a teen who was just starting to sew my own clothes, I used Colleen's sense of style to give me inspiration. I have had such fun looking at some of her photos posted online from Seventeen Magazine. I hope she is enjoying a good life. Thanks Colleen for such wonderful memories through the pages of Seventeen! I am now a 63 year old grandmother as like so many others, Colleen Corby and Seventeen magazine were some of my best teen memories. I'm glad she is happy and is doing well. She brought a great deal of fun to my teen years. I am now a 63 year old grandmother and like so many others Colleen Corby and Seventeen magazine brought a great deal of happiness to my teen years. I'm glad to know she is happy and doing well. I loved Colleen as a pre teen and teenager… I wanted to BE her!! She is stiłl beautiful today!! I was a teen during the time Colleen Corby modeled. I remember seeing her beautiful face on Seventeen magazine covers, in ads, magazines, and catalogs. At that time there weren’t many, if any, beautiful models a young African-American teenage girl could identify with, or look up to. For me, it was Colleen. No, she didn’t look like me, but I thought she was the prettiest, most beautiful girl I’d ever seen in magazines. No other model could touch her in the way she exuded confidence, grace, and poise. Her facial expressions, her eyes, and her beauty said it all. I so admired her. I don’t know what her personality was like, but her looks glowed with fresh innocence. I’ve never seen a model from that time, and even up until now, model the way Colleen Corby did. Awesome! !